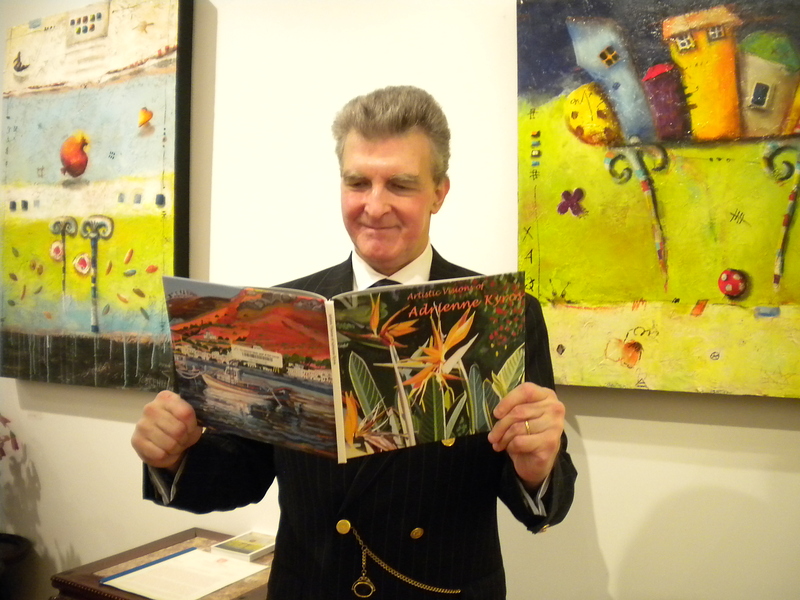 AMSTERDAM WHITNEY GALLERY, 511 West 25th Street, Chelsea, New York City, is proud to show in its MAY 6-JUNE 14, 2016 Exhibition leading Contemporary Master Artists whose work explores the abstract, figurative and natural worlds, exalting the realm of the aesthetic through brilliant coloration and dazzling form. This special “SALUTE To The STARS!” exhibition boasts more “Stars than there are in Heaven” and offers a sparkling tribute which will dazzle the senses of both art acquisitors and art aficionados alike with its incandescent renewal and regeneration of the visual realm. Pulsating with dynamic synergy and artistic creativity, these artists’ sophisticated, eclectic and often joyful representations of the world shine the spotlight on a unique, universal artistic language. Highlighted by the glamorous and elegant Saturday, May 14th 3:00- 5:00 pm Champagne Reception, each artist has the unique capacity to circumnavigate cultural barriers and nationalistic identities as they translate contemporary global art to transcend the scope of language, translating their views into a universal manifestation of international artistic communication. Reflecting the revitalizing penetration of compelling global ideas in our culture, this cross-continental conversations in art, will dazzle the senses during the spring season for both art acquisitors and art aficionados alike with its incandescent aesthetic explorations of the visual realm. CANDESCENCE of the STARS is a celestial constellation showcasing international artists based in the U.S. and Canada whose incandescent paintings intricately interweave a sublime tableau, reflecting an expressionist connection between humankind and the wonderment of the terrestrial realm. This heaven-on-earth exhibition emphasizes ravishing juxtapositions of line and form as these masterful artists communicate the ambrosial joys of our environment and interject their luminescent compositions with exciting, positive spiritual energy. Offering a parallax vision to the majesty of the natural world by creating a magical, enchanted kingdom, their works joyfully burst with dynamism as they ethereally illustrate the splendor of the natural terrain. ANDREA HARRIS’ elixir to nature landscape paintings ethereally immortalize nature’s transitory essence as they offer a modern interpretation of the landscape genre while exuding the romantic allure and mystery of nature. THERESA LEE’S dreamscapes capture the ephemeral essence and tranquility of the natural terrain while maintaining a delicate balance between earth and sky, realism and abstraction. 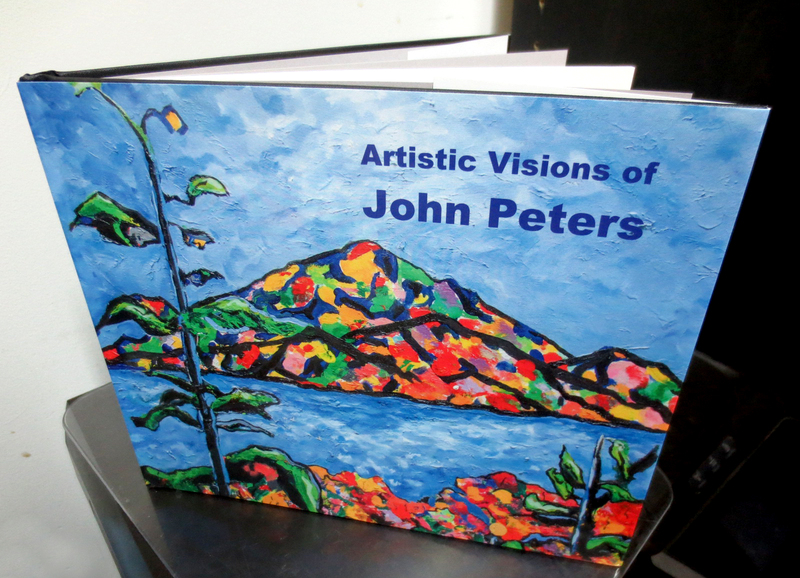 JOHN PETERS’ expressionist nature paintings brilliantly convey the complexity and profundity of the natural terrain illustrating ravishing, colorific expressionist reveries of magical realms. SYNERGY of the STARS is a sparkling exhibition which represents the apex of excellence reflecting the work of two masters who offer an international perspective to the sensorial realm by illustrating powerful artistic interpretations of the world. Their imaginative quest for new artistic horizons and sensorial synchronicities explores inner visions and emotions rather than words as they transform interpretive realms into poignantly mystical beautiful works of art,. As they illuminate the mysteries of the world, they offer unique insights into the wonderment of life. PHILIP CATANIA’S opulent Surrealist compositions translate reality into dream-like fantastical scenarios which are an amalgam of line and form revealing multiple layers of human emotion as they capture the everflowing essence of human emotions.AI-WEN WU KRATZ channels the energizing act of painting into a fresh form of visual syntax imbued with a rich, ebullient two-dimensional, textural effect, providing a provocative imagery of spiritual revelation. STARLIGHT SYNCHRONICITIES challenges the eye with three masters from Canada, France and the U.S. whose expressive paintings reflect the visceral qualities of the human heart by revealing a huetopian quest of colors juxtaposed against a polarity of shapes that pulsate with electric energy. Ignited by the dynamic use of brilliant and bold pigments which capture the dichotomy of human emotions, their visual odyssey explores the unconventional images of the spirit. Always evolving into a profound metaphoric message through their metaphysical search, they create a virtual fireworks display of creative and exuberant energy infused with emotional power and bravado. BARBARA MUIR’S figurative-landscape “Ocean Series” reverberates with a clear, unique artistic vision which reflects a deep reverence for nature and a passion for our oceans,landscapes and inhabitants of our environs. ALAIN ROUSSEAU translates his fascination with the animal into an anthropomorphic portrayal which pays tribute to the boundless beauty and glory of the animal, inspiring us to create a world where humans, animals and nature can coexist in harmony YELENA TYLKINA’S profoundly evocative expressionist art explode with captivating force as she interjects her compositions with kinetic movement which are infused by a bold color-wheel and visceral shapes. LUMIERE- CAMERA- ACTION! is a stellar photographic compendium that shines the light and unravels the mysteries of the world as seen through the camera lens by two American photographers and one Israeli photographer. Transcending cultural boundaries, their visceral photography reflects expressive “third eye” which vibrantly mirror the energy of life. These masterful works invite the viewer to expand our artistic horizons to form new viewpoints as they explore the profound complexities of the world. Encouraging audiences to interact with powerful and forceful compositions, the results of this dazzling survey are utterly compelling works whose bold intensity and dynamic truths communicate sizzling artistic observations which convey a rich new photographic lexicon. YNIN SHILLO’S photography offers alternative realities and is a testament to the imagination and myriad ways of viewing the world as he transforms everyday scenarios, extrapolating unforeseen images. BARRY UDIS’ photography communicates feelings about the natural terrain as he celebrates the transparent patterns of nature and its reflective surface in the landscape. SCOTT WEINGARTEN’S digital photography is inspired by a romantic vision of women who are adorned in glamorous and/or antique fashion as they luxuriously exude sophistication and feminine allure. 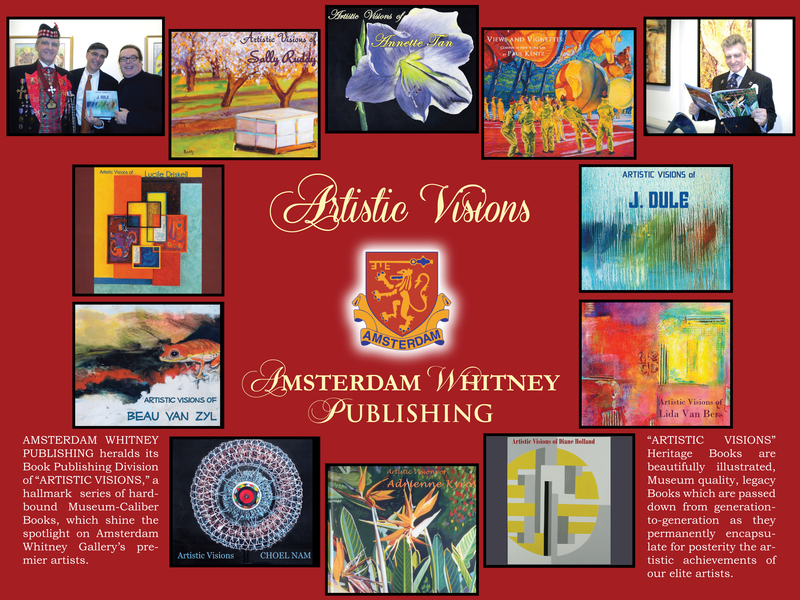 AMSTERDAM WHITNEY PUBLISHING heralds its Book Publishing Division of “ARTISTIC VISIONS,” a hallmark series of heritage, hard-bound Museum-Caliber Books, which shine the spotlight on Amsterdam Whitney Gallery’s premier artists.